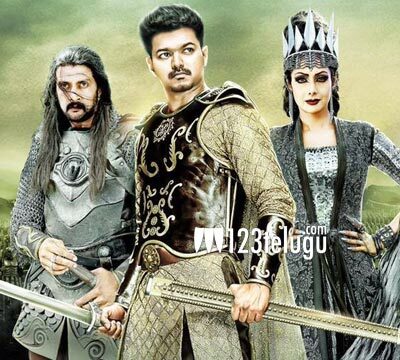 Tamil superstar Vijay’s upcoming socio-fantasy thriller, Puli, is getting ready for a massive release on October 1st. Directed by Chimbu Devan, the film has Shruti Haasan and Hansika as the female leads. The Telugu audio launch event which was to held on September 19th was cancelled due to some unknown reasons. A few hours ago, the audio CD was unveiled in Hyderabad by music director Devi Sri Prasad. Successful producer Dil Raju and ace director Koratala Siva graced the event. SVR Media is distributing the film in both the Telugu speaking states. Yesteryear actress Sridevi and Kannada superstar Sudeep are playing crucial roles in the film.